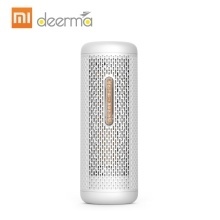 The high moisture levels can lead to growth of mold and mildew which can damage your health and your belongings, and the Deerma Electric Air Dehumidifier is designed for improving the humid atmosphere, built-in ceramic PTC heating plate, 600g desiccant particle to absorb the moisture, perfect for multiple house area, such as wardrobe, shoe cabinet, bookshelf, etc. – Ceramic PTC heating plate, good thermal conductivity, fast drying air and remove moisture. – 600g desiccant particle, mini Size but good performance. – ABS material, stable base, many of holes for improving moisture absorbing. – Simple structure and rounded design, a beautiful art on your home. – Visible drying condition, orange particle – normal use, and green particle – heating & drying. – Perfect for multiple house area, such as wardrobe, shoe cabinet, bookshelf, etc.